After being deported to Mexico last year, Maria Mendoza has been granted permission to return back to Oakland. She is expected to be home by Dec. 15. 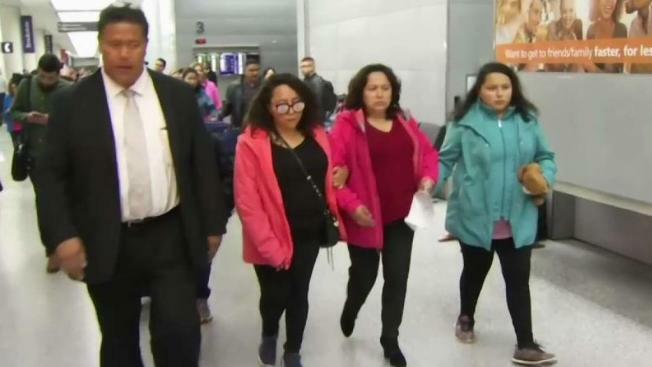 An Oakland nurse who was deported to Mexico last year is one step closer to being reunited with her four children in the Bay Area in time for the holidays. Maria Mendoza Sanchez entered the United States illegally 20 years ago, raised a family, never got into trouble and became a nurse. On Monday, she was at the U.S. Embassy in Mexico City, where a State Department official agreed she should be allowed to come home. "I was very happy," Mendoza Sanchez said. "I mean, you could imagine how much I missed my kids. It’s been very difficult." Mendoza Sanchez is happy because she is a step closer to an H1B visa that would allow her to return to Oakland with her children. "As time is going by, they have become more withdrawn from everybody," she said of her kids. Camiel Becker, the family's attorney, says he has to share credit for the legal victory. "They were particularly interested in all the media coverage this case has received and were also interested in [Sen.] Dianne Feinstein‘s report," Becker said. Mendoza Sanchez's occupation, an oncology nurse at Oakland’s Highland Hospital, works in her favor. But having entered the U.S. illegally with a child 20-plus years ago works against her. Her only hope is a waiver on the H1B visa. "Knowing that she’ll come back, we’re just very overwhelmed, and we’re so happy," said Melin Sanchez. "Hopefully, she could come back for like Christmas." The work visa will be good only for a few years, but they’d be critical years for Mendoza Sanchez's two teenage children.